You are here: Home / Rabbits / 17th – 25th June is Rabbit Awareness Week! 17th – 25th June is Rabbit Awareness Week! 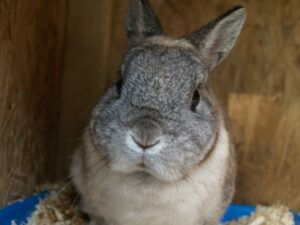 This year’s Rabbit Awareness Week (RAW) campaign, organised by Burgess Pet Care, is focused on raising the importance of feeding hay in rabbit diets, after findings in the PDSA Animal Wellbeing 2016 report showed that 30% of rabbit owners report their rabbits don’t have constant access to fresh water and hay. 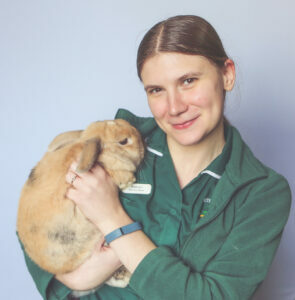 By taking part in this year’s RAW and raising awareness on rabbit welfare needs, we hope to reach out to more rabbit owners and ensure the needs of their pets are being met. A rabbit’s diet should consist of up to 85 – 90% feeding hay. Many owners don’t know the difference between feeding hay and bedding hay. By encouraging more rabbit owners to come into the practice during RAW 2017, we hope we’ll be able to address more of these needs and encourage more responsible ownership when it comes to looking after rabbits. Dr Suzanne Moyes MVB MRCVS, Technical Director at Burgess Pet Care, one of the UK’s leading pet food manufacturers, is optimistic that the involvement of so many veterinary practices will lead to rabbit owners taking more responsibility when it comes to ensuring the correct nutritional needs of their rabbits are being met. RAW is an annual event that brings together vets, pet retailers, welfare charities, manufacturers and consumers to raise awareness about rabbit welfare issues and to encourage responsible pet ownership. Official RAW partners include: Agria Pet Insurance, RSPCA, RWAF, Wood Green The Animals Charity, PDSA and Blue Cross. As part of our upgrade this year we now have a rabbit specific ward. This allows rabbits to be housed totally on their own (rabbits are ‘prey’ species so do not like being anywhere near cats or dogs), they are also housed at ground level which most rabbits find preferable.We have a dedicated ‘Rabbit Advocate’ nurse and all our staff are trained in handling rabbits to keep them as stress free and safe as possible. You can request to wait in a quiet area if you turn up for an appointment and our waiting room is busy, ask any member of our team. https://www.withygrovevets.co.uk/wp-content/uploads/2017/06/Smoky.jpg 1080 1440 Michael Clarke https://www.withygrovevets.co.uk/wp-content/uploads/2019/04/Withy-Grove-logo2.png Michael Clarke2017-06-15 18:08:512018-03-05 15:21:3117th - 25th June is Rabbit Awareness Week!